This large, noisy songbird can be a variety of shades of blue, with a white throat and black "necklace" and black-barred wings and tail. Its underparts are white and light grey. Blue jays inhabit all provinces east of the Rockies, ranging from evergreen forests to suburbs. Canada now has only one baseball team...the Toronto Blue Jays. Twice in a row they have won the World Series, in 1992 and 1993. They have just won Game 5 ( a do or die game against the Texas Rangers)....The team could p,any and win another World Series in 2015. I think we should honour Canada with this bird which will come out to play for peanuts. I like the Grey Jay, but how many Canadians know about it, but I would expect most Canadians know of the Blue Jay. The team has so much heart, and the ability to triumph when the chips are down. And comparing the fan support in Toronto compared to that in Arlington, Texas...our stadium was jammed every game, Texas was largely empty, sadly. I am 7 years old and like the Blue Jay because like Canada it is beautiful and funny. It can be hard to find but once you see it you will love it forever. I think the Blue Jay should be the Canadian National Bird because they are strong, smart, and bold. They hide their nuts ahead of time for consumption later. They can also fly for a very long time and distance because their wings are very strong. They fly high and that implies that their better than other birds. Their colours blue and white are the same colour as the Toronto teams The Toronto Maple Leafs and The Toronto Blue Jays. So they represent us that way. They are highly adaptable and intelligent birds. They can do excellent imitations of several hawk calls and raptor calls. Some birds are afraid of hawks and Raptors so the other birds fly away and the Blue Jay get to eat what the other bird was eating. They live in forests, woodlands, and parks. They also love to hang around feeders in your backyard. They are highly adaptable in urban and rural life. So that means they are seen all around Canada so you will see them a lot. Most of their diet is composed of acorns, nuts, and seeds—though they also eat small creatures such as caterpillars, grasshoppers, and beetles. The Blue Jay is a tough bird. They will beat other birds to the feeders. If they are not comfortable with other birds they will screech at it and scare it away. Some Blue Jays will migrate over the winter but others won't. Some like being outside in the winter and no one really knows why. But most birds like the summer over the winter. Why do you care? Well we Canadians want to be known as strong smart and bold. When people find out that the Blue Jay is our National Bird they will think WOW Canada is a really strong country! That’s why I think the Blue Jay should be the National Bird. Beautiful shades of blue all year long and this wonderful bird can be found throughout our country - in both rural and urban areas. It can survive the harsh winter weather and accepts with pleasure the wonderful summers - what other bird can claim to be any more Canadian than that. I like the Blue Jay because my Daddy takes me to Blue Jays games, and gives me a big smartie cookie! We only have one baseball team and it's the blue Jays.... Our national bird should also be the blue jay. i think we should pick the blue jay because of the baseball team. i was debating between the canadian goose and the blue jay but the Canadian goose is too obvious. i vote for the blue jays. Beautiful bird here year round. 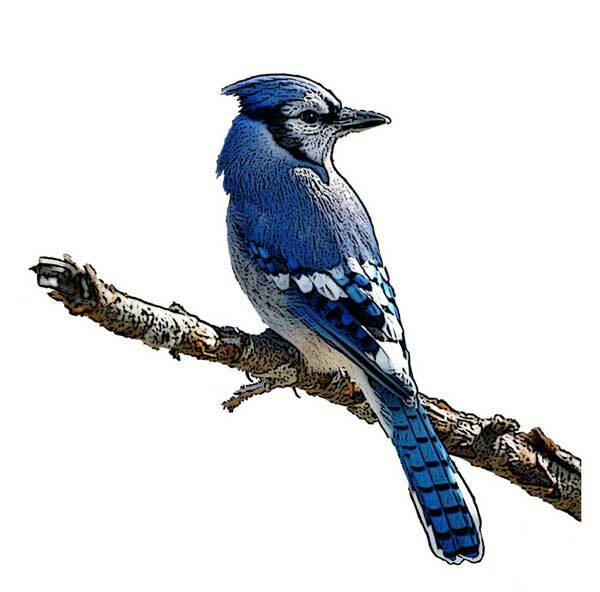 I think a Blue Jay should be considered our national bird because its a song bird that is beautiful...and it is the bird of our national baseball team! We have blue jays in our yard daily all year round and enjoy their classy, beautiful colours and sassy calls and attitude! We have a lot of Blue Jays in our area and the splash of blue in the trees is a beautiful sight. I do love the Loon and the haunting call it makes but it is already the representative of Ontario. As is the gorgeous Snowy Owl of Quebec. The Blue Jay to me is the most colourful bird I see most often, and feel it is a perfect pick as our National Bird. My wife and I - and grandchildren when visiting from far off - place peanuts on our deck rail and love to watch the Blue Jays come and get them. Some take just one peanut; others put one in their craw and select another in their bill. New birds do not trust us being so close to their prize, but after watching other more trusting birds come without fear, they eventually join the throng. I am aware that the Blue Jay is known for their obnoxious, screechy call, but to me that call breaks the winter silence and brightens those long winter days. We have between 16-20 regular Blue Jay visitors to our feeders daily. I have learned so much by observing their behaviours over the past few years. They seem to have leaders which command respect and the majority of the sun flower seeds. I love watching them throw the seeds considered inferior to them until they come across the coveted sun flower seeds. They are intelligent enough to use tools to help them open those shells as I have watched them return to a certain branch again and again to split the shell open. They have a language all their own that warns the group about the impending kestrel attacks. They also have a different call to alert the others that the feeders have just been filled. The brilliant flashes of blue brighten otherwise grey winter days. I am so thankful for them all and feel they deserve to be the national bird for the excellent job they do cheering us up and carrying us through the Canadian winter! After living close to the Rogers Centre in Toronto, and constantly seeing hordes of Blue Jays fans, I feel that the Blue Jay is an important part of my life in Canada. I believe the Blue Jay would be great to represent Canada. Since people seem to want to subscribe to the lifestyle and character of the chosen bird to represent us, the Loon is out. We already have the Loonie coin. So are Canadians Loonie too? The Blue Jay to me represents equality. Unlike many birds the male and female look the same. In Canada we are so far ahead from the United States when it comes to equality of the sexes. Not that there isn't room for improvement but I love that the Blue Jay looks the same. They don't take off to warmer weather in the fall. The Blue Jay toughs out the worst Canadian winter can throw at them, and yet they stay. The Blue Jay is beautiful. When everything is covered in snow and there are no flowers or leaves to enjoy they stand out and remind us spring will come. Yes they are loud, usually when talking to their fellow Jays. Have you ever been to a Blue Jays baseball game? Fans are loud and proud. Beautiful with a great voice. The name of our national baseball team. Canadians coast to coast to coast support and follow the team. Everywhere you go in the world you will see someone with a Blue Jays shirt or hat. Bluejays don't migrate. A strong bird in the environment. Very colourful with distinctive call. A beatutiful strong bird with loads of personality, present all year round. I have lived in 5 provinces of Canada. The blue jays have been my welcoming committee in each of these provinces. I can't imagine living in a place that did not provide the raucous, joyful voice of the jay (it was the stellar jay in BC). I live in PEI, by the water. The chatter of blue jays surrounds me all day long and I am immensely grateful for their company. The Blue Jay decorations hang in our home and live in our area. They are wonderful to view and are not really appreciated. They represent Canadians international in one of the most favourite North American past times baseball of course. The blue jay a nice contrast to our national colour of red and the Maple Leaf flag. I chose the Blue Jay because this bird stays here all year, this is a hearty bird just like all Canadians and can be found in every province and territory. at least 20 bluejays get their peanuts every morning in our round-year feeder. They start asking for their food at the sunrise and we love their screaming, screeching and demanding calls. Our favorites! The Canadian Blue Jay appears in every province and is also our only baseball team as the 'Toronto Blue Jays'. The Blue Jay loves peanuts, will follow from tree to tree to see what you have to feed them. They are delightful to watch and have beautiful feathers, in August each year, they moult their cap and fly about looking like a different bird without their royal cap. They alert all the birds when predators come around, a hawk, for example. It would be a missed opportunity to not crown this bird as Canada's bird. when I first heard of contest, it is the first bird I thought of. No essay, just three facts: they're big; they're beautiful; they stay here all winter. All birds are beautiful and Canada is blessed with beautiful nature and diverse wildlife. It is a difficult choice, however, I love the bright colour of the blue jay and the fact that I can see it in my own backyard. I want to vote for this bird because it's the bird of our national baseball team (blue jays) ever since 1977. It's a beautiful, colourful, proud-looking bird. The blue jay is an beautiful bird that is smart, adaptable, even canny and lives in more habitats throughout Canada than almost any other bird in this list. I love BLUE JAYS, we have some that come to our feeder to eat. I've seen their cousins the grey jays and also beautiful.....the blue jays have stolen my heart. Blue jays have good meaning of strong spirit and victory! My husband and I had a Blue Jay visit us on a daily basis. We called him 'Kookie". His visits started on our balcony where we placed peanuts on the picnic table. Then we began leaving our sliding doors open and placing peanuts just inside the door and to our great pleasure he jumped inside to get his peanuts. But it didn't end there. We started placing the peanuts further and further into the house... on our kitchen centre island, then onto the dining ooom table and finally onto the chair arm. Kookie was such a joy to watch. He was so bold and wasn't even nervous that we were sitting right there as he picked up his reward of peanuts for the day. Kookie was so beautiful and very determined to have his peanut as one day before we had opened the door for him to come in he hit the window with his beak several times to alert us. We truly loved this beautiful, bold, intelligent bird. God's gift to us. This is a bird which is present across Canada and is the most celebrated sports bird we have. As in the popular Toronto Blue Jays. Canada's baseball team. Make it happen, Canada. I love the spectacularly beautiful songbird that is the "Blue Jay". It should be voted "Canada's National Bird" because it is native to Canada, and is just like a Canadian: Gorgeous and smart and territorial (which I interpret to mean it is proud of its territory and happy to defend it). Since the loon is already depicted on our $1 coin, this is a chance for the inimitable blue jay to be more than just a mascot for a baseball team. If, like me, you are stunned to learn that this country does NOT have an official 'national bird', especially in honour of Canada's upcoming 150th birthday in 2017 please join me in voting in Canadian Geographic's poll to choose the Blue Jay as Canada's Official National Bird! -- I'm posting this on my Facebook page, and encourage the techies at Canadian Geographic to add 'share' buttons to make it easier for other Canadians to help publicize this important vote! For one, the Blue Jays are the Only National Baseball team Canada has, it only makes sense that we make the Blue Jay our National Bird. For Seconds, there are a bunch of them around Canada. You literally see them everywhere, and for thirds there one of the most beautiful birds in my opinion. And that is why I Believe Canada's National bird should be the Blue Jay. Just seems fitting. We have the Toronto Blue Jays as our baseball team. The Blue Jay has a distinctive voice and is a real presence in the woodlands and yards of Canada. The striking colour makes them easily identified by all. Easy- it's a beautiful ( colorful ) bird, can be a sneaky lol and ofc the Toronto Blue jays. I noticed on your maps that they do not breed or even live here on the west coast. Some one should tell all the Blue Jays I see. Same thing goes for the Ruby Throated Humming Birds I see all year round. Makes me wonder about your accuracy. The Bluejay is the only bird I can stop and just look at them in awe. They are beautiful bird like our country. Everyone can identify a Bluejay - not only by sight but it is also very vocal. The blue jaya is fantastic. The BLUE JAY is the Nickname and Logo of my now favourite Major League Baseball team...so, why not? I love Toronto Blue Jays, so I pick the Blue Jay!! Seems to me that the Blue Jay can be found in all our provinces and in all seasons. Not only that, most Canadians can identify the Blue Jay. The blue jay is a pretty sweet bird. Straight forward pick. An easily identifiable bird that is found almost anywhere in Canada, as I've seen them while living in NB, NS, ON and AB, where I very sadly hit one as it landed in front of me on a freeway =( They eat the occasional pest, their plumage is attractive, they are intelligent and they are bold enough to call at and chase predatory birds in their territory. This bird is very Canadian. The Blue Jay is the most beautiful bird I have ever seen. The colors are so vibrant. The blues really come out on this bird. This bird is native to Canada and we cherish it with all our hearts. The Blue Jay is a symbol of our National Baseball Team. We love the Blue Jay so much. If you are among the few people to actually see a Blue Jay you are very special. I myself have seen the Blue Jay with the Cardinal. These birds are so beautiful. Canada's team and Canada's national bird. Let go Blue Jay! Canada has one MLB team, the Toronto Blue Jays. It would make since for the team to be called the Toronto Blue Jays with the national bird as the Blue Jay. As well, Blue Jays lit. Robbie K SMOB thank you. Blue jays are smart, interact with people and have a many different calls, a very nice bird. Am Canadian for a decade now and I am from Indian subcontinent, India is all about color be it our food, cloths, festivities and even our animal are very colorful. My initial days in this mighty land was colorless as I arrived in winters, all I experienced was dull and grey as it was all covered with snow, Missed my home and the spectrum of color which my mind was so used to. I craved for color in my life to my dismay I even bought a dark grey Parka to shield me from Canadian cold. I was getting depressed as it was hard to start from the scratch in this new country; I lived in a rented studio apartment which open on a ravine, That was my escape from sadness of missing home as I watched weather turned its leaf. On onset of spring I saw birds visiting my backyard’s small maple tree. There I noticed this beautiful bird which was grey and blue, it was beautiful and was a quite a show off too. "Jay- jay." call would get my undivided attention that noisy presence was not a bother at all it was my delight as I watched this beautiful bird trying to woe mates with it tactics when it was not too busy looking for food. “The blue jay is between 9 and 12 inches long. It is bright blue on top and white to gray on its throat, chest and belly. It has a gray-blue crest on its head and black and white bars on its wings and tail. Its bill, legs and feet are black. It also has a black "necklace" on its lower throat.” Came out when I Googled the visitors characteristic. So it was called Blue jay!, nice name, it further stated “ The blue jay is very aggressive and territorial. Groups of blue jays often attack intruders and predators. They often drive other birds away from bird feeders. The blue jay is also very vocal. It makes a number of different calls including its distinctive "jay- jay." It also growls, whistles and chatters”. Later as time went by I Googled further, I was bombarded by information with regards to the famous Canadian Baseball team with same name. Few weeks passed and I saw this bird was getting more daring and was exploring near me, I offered some peanuts with shells which they loved and wanted more, I learned about their food habits and offered them more choices, we become so comfortable with each other presence that they would come around me and even take food from my hand yet we respected each other’s space. By late spring we were friends I learned about their life and how they live, in this bargain I became an avid baseball fan too (no prize for guessing which is my Team).I forgot about my pain of not seeing color and these blue Jay brought smile on face and made me adapt this wonderful country much sooner than expected. Our relationship has become more stronger as I welcome them every spring with the food they like and since past 4 years I plant giant sunflowers in my house (hundreds of them) and when they are about to seed I see them again with the whole gang feasting on them as if it’s their thanksgiving feast on onset of Fall season. They have given me immense joy and pleasure which can’t be bought .They are the driving force into transferring me into a naturalist, nature lover ,veracious Canadian Geo reader and a proud Canadian, I can’t think of any other bird who would be National Bird of Canada then these magnificent graceful Blue Jays. Its' indiscriminate cry of recognition, to stop, pause, feast on the visual of its calming Sea Blue feathers, see what it sees, think and take a human breath to appreciate the borrowed earth. Blue Jay always seem to be Canadian. I have never seen it elsewhere. The Eastern blue jay is very handsome. The male is the more colourful of the two ie male & mate. Their sound is distinctive & easily identifiable when heard. Although I have seen & admired the western blue jay....which I happened to see while in Western USA...it's the eastern blue jays that live in Ontario that I admire for their good looks. Blue Jay is one of the most colorful birds, and it stays here all winter. Je connais cet oiseau depuis ma jeunesse. Son chant mélodieux m'enchante. Pour moi cet oiseau est celui conviendrait parfaitement au Canada. Blue Jays are beautiful! They are so vibrant in color and pretty majestic looking too. Their song is a little sharp but at least you know it's them coming to eat corn and sun flowers in your garden. I have a bird feeder on my window so I am privaledged to see the beautful blue jay everyday. I enjoy watching them fly back and forth between their nests and the bird feeder. They often line up to take turns. One or two will be in the bird feeder while others line up and wait on the branches of the tree closest. In the early morning hours the first blue jay will call out to the others to let them know there is fresh bird seed. If we haven't put out the refill of seed they will usually knock on the window to let us know we need to fill it up. They are not shy as when they see you enough are quite confident is staying an enjoying the seeds. Our family really enjoys watching them fly back and forth. I think this would be a great bird to be our national bird since not only are they beautiful but show qualities of working together as a team and are organized. For this reason I would like to vote for them to be our national bird to represent Canadians working together as a team and being organized in the running of our country. There's the beautiful bird and then there's the beautiful game of baseball. Blue Jays are Toronto's Baseball Team and they are amazing. a since of peace and beauty all wrap into one. Firstly, I have always thought the Canada Goose was our chosen bird, not that I believe it to be the best choose. I have chosen the Blue Jay for its royal call and its brillent color. It has always been associated with Canada forest areas. What better way to honor our Toronto Blue Jays then to make the Blue Jay our national bird. The Blue Jay is a beautiful bird any season of the year. It is beautiful against the white snow of winter. To see flashes of that beautiful blue among the fall foliage is always a real glimpse of beauty. So any season it is lovely to see. It's cheerful, fresh, alerting call, to stand up be seen and be mindful. It's softly hued plumes glazed with the sky and the earth. It's trustworthy nature and snappy palate for a tasty seed. It's keen eye for a sturdy branch and its resilience to hang on until a better one is seen. This is Canada's bird. Mascot of the freaking Toronto Blue Jay's! They're epic! One of the few birds that still make me run to the window to see. Always around, but never around. It should be the Blue Jay. Canada's only baseball team is the Toronto Blue Jays. Not the Toronto Common Loons. Blue Jays are the most fun birds to watch! I don't have an essay, but there were many Blue Jays nesting where I grew up and I always found the blue to be sucha striking colour. Unites a country for a just cause. There's only one bird that flies north of the boarder and it soared in 92, 93 and hopefully a gain in 2015. The Blue Jay represents all that is Canadian! My essay on the Blue Jay? Canada's bird since 1977. While it may not be on the currency, this bird United the country in the 80s and 90s and is doing so again in 2015. They're pretty birds. That is all. The answer clearly is that Canada's national bird is the Blue Jay. End of story. Toronto Blue Jays. That is all that needs to be said. GO JAYS GO this should be our national bird. In the cold of winter I love to see the fibrant blue coloured jays in the cedar trees outside my kitchen window! The Blue jay, is just like your manager,, in your office,, he,, just drops in,, picks up the facts and files... asks no questions..
He,, yells, and makes all the calls.. I knew that life,, long ago,, and every time,, I hear,, and feed a Blue Jay,,I tell ,, him so.. worked on Wall Street,, Did you know? a few days ago i found out that a blue jay nested beside my trampoline. Then i realized there was 3 babies. And a husband.The babies were so cute. i love blue jays! IN my opinion they are the most beautiful backyard bird. everyone would want to see with its calming colours. And last but not least it’s calming sound is what every body wants to wake up to. That’s why I think the blue jay should be the national bird of Canada. Last but not least Canada has a baseball team so people might know the blue jay in Canada from that too and from those facts you should vote for the blue jay. I think the most amazing bird is the blue jay. Even though the the blue jay does not have a pretty song but its wingspan is 34-43 and sure it's not that big, but it helps them fly faster to get away from predators or catch food .like a bigger bird and that is an adaptation. The blue jay is an omnivore. Do you think the blue jay is worthy of being Canada's national bird? The blue jay is a songbird. The blue jay is blue, white and black. I am voting for the Blue Jay as Canada’s national bird. The Blue Jay is a beautiful bird and deserves to be Canada’s national bird because of how well they represent our country.These birds weigh about 70-100g and their length is 25-30cm! This bird has a black ring around it’s neck and pretty white and gray colours on the underparts. Another one of the many cool reasons of why the Blue Jay should be Canada’s national bird is because it stays in Canada all year round! The colours on the Blue Jay are the same colours as Canada’s professional sports teams Toronto Maple Leafs and the Toronto Blue Jays. The Blue Jays scientific name is the Cyanocitta cristata and belongs to the corvidae family. And those are some of the reasons why you should vote for the Blue jay as Canada's national bird. Blue jays have cute little babies, and they blend in with the clouds and the sky. I like the Blue Jay because it is coulorfull and stays in Canada all year `round. I like the blue jay because I think its cool. I think the blue jay should win because it makes a really nice sound. i like the blue jay because the toronto team is the blujays. The blue jay has a lot of sounds. please vote for blue jays because it is easly adaptable and it has a nice call. please vote for blue jay!!!!! I think the Blue Jay should be Canada's national bird because it is such a cool bird and it is a popular bird here in Canada and there is a canadian team representing the blue jay. The Blue Jay should be named Canada’s national bird because their all over Canada. Blue Jays are wonderful birds that we all love. They are awesome and dominate other birds like Canadians. They also have wonderful fun songs.These birds are also have their own baseball team I mean who doesn't love the blue jays. So I think lots of people should vote for the blue jay because their wonderful birds. These birds are everywhere even near your house feeding on things like ( YOUR HOUSE PAINT).These birds deserve to be Canada's. I love the Blue Jay and you should to. Blue Jays use body language to communicate they also use bird calls. They use their crest to show if their feeling aggressive. Blue Jays eat many types of foods. You should definitely vote for the Blue Jay. I am 10 years old. I think the Blue Jay should be Canada's national bird. They have bright and bold colors and they also are named after a famous Canada baseball team. Blue Jays have white and blue on them and the white can represent Canada. Blue Jays have a weird and cool way to communicate with body language. Their crest is a beautiful shade of blue and people are dazzled when the see their cool crest. Blue Jays are fun to watch and have the most wonderful call so that is why you should vote for the Blue Jay. VOTE FOR THE BLUE JAY! Its a cool, and unique bird. And seen as they fit in with the coldness of our winters, theyed fit in well to being our national bird. The reason I chose the Blue Jay to be our national bird is because of a memory of when I was a young girl. I woke up one morning to a blue jay on the kitchen table. I don't know why or how he got in, but my dad was really delighted. Somebody took a photo for our family album, and so I never forgot. The bluejay is such a beautiful bird and can be seen year round. A true north strong and free bird. J'adore les geais bleus. J'en ai eu dans ma cour arrière et chaque matin je leur parlais. This little guy is tough enough to stay here in the cold winters, does not need to fly south. Also does not stand back when protecting its nest, I have seen more than one blue jay peck a much bigger cat right in the middle of the forehead when the cat tried to get close to its nest. And finally their sound of "jay,jay" is like "Jay.eh!" How more Canadian can you be? Them it has lost of colours and it has the maple leaf symbol.. The blue jays are my favourite baseball team. I like them because they fly fast and they eat worms. They sound great and blues my favourite colour. Blues my favorite Colour. It's a beautiful bird. Since the Toronto Blue Jays are Canada's baseball team, I think they should be Canada's bird. They eat bird seeds. There is nothing more Canadian then this beautiful Blue Jay !! See, many books which have been written by John Marzluff..
Furthermore,, most Canadians, see, hear,, and never forget the true blue colors of the majestic plumage,, perhaps,, and it is a reflection of what keratin and our eyes.. conceive.. Against the blue skies,, their call, shapes my life,, as my reports on E-Bird Canada, will prove... Many have learned my name.. They mimic,, MOMMMY.... Gregarious,, smart, starlwart,, but not invisible... 9 this morning have gathered for wedding vows.. The blue Jay is found across Canada and symbolizes the beauty of not only our lakes and waterways,but the majesty of the varied terrain and regions across Canada.Its striking colours brighten our seasons and lift our spirits.I think the Blue Jay is a true sybol of Canada and all of our people and would be proud to have this as our national bird.Thank you. Pour moi, c'est son extraordinaire plumage bleu! I would like the blue jay because they are all around us on a daily basis so that everyone can see them and say "that's our national bird!" I like the Bluejay because it is such as majestic bird and we are a majestic country. I think the blue jay would be the best bird to represent Canada because of its majestic look & bright colours. Jays are also saucy, aggressive birds and I would like to think that we as Canadians are majestic, a little bit saucy and determined to be the best. If you know the bird that I’m thinking of? If you said the blue jay you are right about that. One reason is its wing span is 3.4- 16.9 inches to 34- 43 centimetres. Its weight is 2.5- 3.5 20 oz. or 100 grams. Its length is 9.8- 11.8 inches or 25-30 centimetres. The second reason is it is a noisy bird and a song bird. It is an omnivore. It eats fruits, acorn seeds, nuts, insects, mice, frogs. Because it lives in Canada and a baseball team is named after it. Jay.” I was walking one summer afternoon and that is what I said to my friend. We saw a Blue Jay, we also heard its call. Here is some facts… Did you know the Blue Jay populations have been slightly decreasing throughout their range since 1966, according to the North American breed bird survey. Also, Blue Jays build their nests in deciduous and coniferous trees, usually 10-25 feet off the ground, and their nesting period is from 17-21 days. Third, this bird is also strong, doesn’t Canada want to be known as a strong country right? For my fourth, and final reason, there are many around, meaning you can see this bird around often, all over Canada. Habitat- Found in all kinds of forest especially near oak trees. Diet- Blue Jays take nuts and seeds in trees, in shrubs and on the ground. They also take dead and injured small vertebrates. Physical characteristics- blue and white pattern, white faced with a distinctive bird crest. A blue jay is one of the most well-known birds in Canada. Why not have this blue jay as our national bird. The blue jay is a large-crested songbird. They are 22 — 30 cm, which makes them a medium sized bird. Its wings and tail feathers are bright blue with black and white stripes. It has a black band of feathers around its neck and head. About 13% of blue jays live in Canada and the rest live in the United States. Less than 20% of blue jays migrate. The blue jay eats seeds and acorns, they also like peanuts. I think the blue jay should be Canada’s official bird because they are very intelligent, they can adapt their surroundings and weather, very well-known and they inhabit most provinces. The first reason is that the blue jay is a very intelligent bird. The blue jay can imitate the red-shouldered hawk and the red-tailed hawk to scare other songbirds away from feeders. The blue jay can also learn to imitate humans and cat’s voice patterns. This bird can also warn and protect other small birds from danger. Another reason is that the blue jay should be our national bird is because it is very adaptive. This bird can stay in Canada all year round. Blue jays can use their surroundings to build a nest. The male gathers bark, grass, rootlets and twigs while the female builds the nest. The third reason is the blue jay is very beautiful bird and well-known. They are one of the most colourful birds in Canada. Almost every Canadian has either seen and/or heard of a blue jay. The blue jay is also a symbol of the Toronto Blue Jays Baseball team. The final reason is that the blue jay lives in most Canadian provinces. About 13% of blue jays are found in Canada. The blue jay nests 3 — 9 meters above ground in oak trees. Blue jays are found from British Columbia to Newfoundland. Canada is beautiful, adaptive, and intelligent, just like the blue jay. These are some of the reasons why the blue jay should be our national bird. What`s blue, chubby, aggressive when bothered, the baseball team with José Bautista, small and majestic, if you guess the Blue Jay, then you are right! That is why I think the Blue Jay (cyanocitta cristata) should be the national bird of Canada. well its a very elegant bird and i'm not sure but i think it is found all across canada. J'aime le geai bleu parce que l'équipe de baseball joue et gagne. The reason why i feel lke the blue jay would be a good pick is because it is such a beautiful bird and they are a big fan of thousands of people thanks to the Toronto Blue Jays and all the fans of them. They are very colourful & noisy! You know when they are around! The blue jay is confident & colourful! If I had two choices my second would be the CDa goose or gee maybe the loon. Too many great birds!! The Blue Jays are beautiful birds, I love to see them and that is very rare to see them. And our Toronto baseball team is named after the Blue jays.. I know that the crow raven and magpie are very smart birds . But the Blue Jay is smart and is quite beautiful . quelques une à ma résidence au Lac Beauport. Dès qu'ils me voyaient par la fenêtre ils arrivaient au nombre de 3 ou 4.
aussi des graines de tournesol etc. Les geais bleu sont très facile à apprivoiser!!! I believe that our national bird should be seen all year long in Canada. The Blue Jay is colorful and easily recognized and fairly common. cet oiseau est magnifique, passe l'année au pays, me visite hiver comme été, j'aime son cri puissant! They are a beautiful and cute bird..
Je nourris les oiseaux depuis près de 25 ans .C'est fascinantd'observer le geai bleu caché sa nourriture ou amener ses petits au "bol d'arachides " .C'est un oiseau intelligent ,il vient te demander de la nourriture de façon si insistante que tu ne peux rien lui refuser ! C' est mon emblème . il est magnifique, robuste, laborieux et passe l'hiver avec nous. je le trouves tellement beau . Tous les jours ils viennent chercher des arachides devant ma fenêtre! Cet oiseau ferait vraiment bonne figure comme emblème nationale du Canada. Il est présent toute l'année sa couleur bleue nous rend heureux . Son chant au son de poulie de corde à linge nous fait rire . C'est vraiment un très bel oiseau qui pourrait représenter notre Canada avec fièreté! The Blue Jay is so beautiful with it's blue plumage and harsh, strident voice. You know it is Canadian when there is a major league baseball named after it. They are Canada wide and more visible in the winter--Canada's season. They're cheeky and bright just like Canadians. Avec sa fière allure ne laisse personne indifférant. The bluejay is the most beautiful bird. It has at least four different colours of blue. The blue colors are magnificent . This is one case where their is no doubt God made this bird. No one else could make something so beautiful. The blue jay is here all year round. Having observed this one for sometime, there was an occasion to learn ! The blue jay is gregarious, social and no matter what the weather usually ready for a good meal on the feeder ! Learned that they actually store seeds from the feeder in the joint of branches where more timid birds can then feed. Beautiful in my eyes ! Hardy and curious. This bird is in Canada all year round. Lovely song and WOW are they ever beautiful. The only thing close is a Puffin. Thanks. Blue Jay is a perfect choice for our National Bird... Strong and Free... A true Canadian!! The reason I think the Blue jay should win is because it is a very rare bird to be seen. In my opinion the blue jay is my favorite and the most graceful and beautiful bird. I find that in the past years the Loon and Snow Owl has been the most popular and I think that for once a different bird should have a chance of being on a coin.For example the loon is on the loonie. From an urban backyard in Fredericton, NB to an Algonquin Park forest, no visit to either would be complete without the screeching call and the flashing blue of a blue jay. When I hear and see them I know I'm home. Ah, Canada. The bluejay is not the nicest of birds as he robs nests and kills smaller birds, but he has an alternate song to his raucus call and he is very handsome, his bright blue making a great splash of colour against the snow. un oiseaux q'on peux pas void beaucoup pendant l'hiver. Like its color and spirit! blue jays are awesome and they should be our national bird because the Toronto Blue Jays are the only Canadian baseball team. Baseball is cool. So are blue jays. Blue jay is brilliant, resourceful, outgoing and proud. Colours represent our water and white our snowy peaks. I am voting for the blue jay because I like the colours of it because blue is my favourite colour and it has blue in it's name. I voted for the blue jay because I like the actual Toronto blue jays. And I really like singing birds and they're cute. Its wings are not really blue, they're a bright coblet colour. I have chosen the blue jay because I like the blue on its body. I think it is the most loyal bird in canada. I think the blue jay is the loudest bird but it wont harm you if it gets mad, it will just fly away. And its not going extinct. It is the noisiest songbird in Canada. Blue jays live in Prince Edward Island. I used to watch these birds around my yard with my Oma when I was a kid. The bluejay reminds me of spring; beautiful coloured bird with songs to sing. When I was a kid we use to have many blue jays on the farm, building nests in the trees and finding the odd little egg that fell out of the nests. Love the bird! I believe that the Blue Jay should be Canada's songbird. They are a beautiful bird to look at. They are strong, independent, yet they work well together. Their call is distinctive. They represent us Canadians!!! have a great day and a nice spring! blue jays are like the best birds EVER the rock the are EPICLY AWESOME I want them to win so much GO BLUEJAYS YAH. I think that the blue jay is the perfect bird for Canada's national bird because it is a bird that is unique. it sets it self aside from many other birds. the fact it has a very nice mixture of colors for which makes the blue jay one very cool looking bird. i also like the fact it reminds me of the winnipeg jets. the blue jay is a one of a kind bird in my opinion as it has characteristics that can be done by other birds but the blue jay is a nice bird. I'd like to vote for the Blue jay is because it's a singing bird. Also a Blue jay is a approachable bird by it's colour, which can attract more tourists. From a fact they're also intelligent. They're also a omnivore, and usually all humans are omnivores which is pretty interesting. And the Blue jay's team is actually pretty good. And some of the guys on the team are actually pretty attractive. I like the blue jay because of its favorable colors. The blue jay is a awesome bird. The blue jay fly's far and wide. It would be a perfect national bird. I like the blue jay because it represents Canada. Blue Jays are found in many provinces of Canada. They are birds with character. ie. They are scrappy willing to fight for their needs. And they are beautiful. I like how peaceful, scenic and beautiful the blue jay is. I think the qualities of this bird are a fair representation of Canada as a nation. Toronto isn't the only part of Canada that has jay's. They are magestic, beautiful and cunning. They are big enough to catch the eye and be of note but small enough to not be overbearing like a predator bird. I think they represent Canada very well for those reasons and more! Blue jays are an incredible part of Canada and should be reflected in the pride we show. I have been feeding wild birds for years. I am a senior and they provide so much entertainment for me. Have to admit the blue jays are a tad bit possessive and will spread their wings to keep other birds from getting seeds, but I still love them. They are so beautiful. When people tell me they do not believe in God, I tell them that man did not make such beautiful creatures as the birds, especially blue jays with those nice shades of blue. The blue jay is a beautiful bird the color of this bird is a beautiful color!! And its my favourite color its the perfect bird to vote for!! the blue jay is very distinctive and colourful. here in Elliot lake just north of lake huron, we see it all year long. it is always a welcome sight. Le Geai bleu est un très bel oiseau avec un plumage particulier. C'est toujours un oiseau qui rend heureux quand on a l'occasion de le voir ou de l'entendre. I believe blue jays are one of the most beautiful birds there are anywhere, but had noticed for a number of years that I hadn't seen any in the areas where I live and visit. I have seen a number in the past year or so, and have read recently that they are increasing in number. I hope that they continue to rebound, and that we will once again have the joy of seeing them in large numbers. The Blue Jay I believe would be a good fit, we already have them as one of our Baseball teams. We have them all around here in Ontario for sure, not to sure if they reside in the rest of Canada. I haven`t study the bird much. Blue Jays are beautiful and clever so why not have them as our national bird. Canada is a beautiful country and so is the Blue Jay. but raptors are out for a country which promotes peace. Cardinals would work out nicely with our flag but that lovely bird does not have the same alertness as does the Blue Jay. become necessary I would like it to be the blue jay. Blue Jays are one of the most intelligent, engaging birds I've had the experience of interacting with. Growing up in a small, secluded, forest-surrounded town, blue jays were frequent visitors to my home, and brought me endless hours of joy. The colours on them are stunning, and the way they look at you, when you make eye contact, is breathtaking. They are beautiful, like our country, and smart, like our residents, so I think the blue jay should become our national bird. In the dead of winter when all the colors have faded with the exceptions of white and gray and black; there are magical beings with the power to lighten and brighten the darkest of days. They are the brightest of blue and as sassy and noisy as any obstreperous child. In the quiet of winter they are a breath of fresh air. As they spread their bright hued wings they are a cheerful sight as they glide across the glistening white snow and into the thick evergreen trees. Many call them greedy when they come to the bird feeders but they love black oil sunflower seeds and I would not see one of them go hungry. They are my choice for national bird for all the above reason and just because I love them. This sassy bird makes its demands loudly, expecting to be fed immediately. The blue jay has entered my home through an open door, crossed the threshold, and left with the peanuts in the living room. With it's raucous call, flashy plumage and neighborly attitude, the blue-jay is one of many favorites in Canada. They love to sing, squawk and otherwise make their presence know. If one neglects to put out peanuts or other favorites, they are very quick to advise, then nag, then outright yell until they are heard. A great bird of Canada. My daughter and I chose separately, but we both chose this one. The color is so bright and the bird is the most beautiful one. If this bird is printed on the coin, every one will love to collect coins. The Blue Jay lives in all parts of Canada and it's plumage colors represent Canada's clear blue sky, it's snowy winters and it's rich black earth. It has many voices just like our multi- cultural country, it has an assertive confident character and is also widely seen during the day. The blue jay is a family oriented bird, keeping it's brood together throughout most of the year. I believe all these characteristics would make the blue jay an excellent symbol as Canada's national bird! R. Thomas. I like very much the ducks for their temper, but the Blue Jay is the most beautiful bird. It is somewhat big and very personal. Who doesn't like? I think the Blue Jay is a beautiful bird and easy to spot because of its colours. A little on the nasty side but they are wild and they very protective so they need to be aggressive because of their size! Love feeding peanuts to Blue Jays that visit my backyard. The Blue Jay is the Toronto baseball team sign. It is the most beautiful one. It looks majestic even though it has a character of its own. I wish the Stellar Jay were one of the choices. Besides flipping the bird, the blue jay should be known as Canada's bird. Go jays go! The blue jay is everywhere in Canada. I like blue. Beautiful, brilliant blue colour. Strong, stoic and adaptable. Lovely singer. They're beautiful, smart, resourceful, and we have a National Ball team named for them. I like the bluejay because they're pretty. Of course the blue jay! I went with the Blue Jay due to it's vast range in this country. It is a bird I feel most if not all Canadians have seen for themselves. My second choice would be the Raven a majestic trickster to be sure. They are the most attractive birds with their vibrant blue. A spectacular promiscuous bird which, most winters, will keep us company. Noisy, flashy, and very attractive. The blue jay is a distinctive, strong, beautiful bird. It's bright blue colour is easily recognized. The blue jay can be quite bossy of the smaller birds but on the other hand it acts like a watch dog if there are predator birds lurking about. It's range is a good portion of Canada and of course south of our borders as well. I believe we need a species that most people would recognize to be our National bird and one that lives in a lot of areas in Canada. The blue jay would fit that description. It's strength of character is reflective of the people of our country and it's beautiful colour represents our wonderful land. Too bad we can't say the same for our baseball team of the same name!!!! BLUE JAYS ARE THE BEST. Colourful, beautiful, and one of the few that can survive the cold winters. They're troopers, like us. If the country is going to name a national bird, it should be familiar, distinctive, widespread in Canada, and a year-round resident. The blue jay meets these criteria. It is a beautiful and striking bird, which stays here year round. It lives in urban, rural, and wilderness areas throughout the country, and so is familiar to all Canadians. Even children recognize it when they see it or hear its excited call. Except for the chickadee (my second choice), none of the other candidate birds, though some of them are lovely, meets these criteria. Blue jay all the way. Blue jays are here all year long and their strength and beauty best represent our country. The blue jay's call to me represents the strength and beauty of Canada. My great-grandmother's favourite bird was the Blue jay and everytime i see one it reminds me of her. A few years ago I decided to take a chance and move with a new boyfriend across the country, leaving everything behind. The new place we moved into had a blue jay always flying around and watching us. I felt like it was her keeping an eye on me to make sure I was doing okay. To this day I still see a bluejay in our yard. It made me feel a little more settled and welcomed. I think the Blue jay portrays how the Canadian people are. We watch over each other and make people feel at home. The blue jay is such a beautiful bird and I see them every year in the summer. I believe this should be the national bird. The blue jay is a true Canadian bird. It doesn't take the wimpy way out and head south for the winter. It endures -40 C temperatures. It's very intelligent, has a wide range of calls/songs and is beautiful. I just love this bird. Blue jays ... the name of our team. They are hardy, tough, stick up for themselves. Although they can be nasty, their cry not so sweet, there they are. Constant. Sitting and waiting. Waiting to steal the peanuts I have left .... for the squirrels. Patient. Just like us Canadians, EH? Blue jays are beautiful birds and very distinctive. They deserve to be Canada's national bird. I vote for the blue jay because he is very visible all year, but not so much that you see him all the time so it's still exciting when you do. C'est un très bel oiseau et il est présent partout. The blue jay is my favourite bird. Beautiful. Independent, cautious, opportunistic, smart, bold, interesting, annoying, winter hardy and fun to watch. Easily recognized and comes in flocks to the bird feeders, isn't too picky but loves sunflower seed and won't eat shrimp. What else can one say about such a gorgeous bird that everyone would recognize and actually get a chance to see in most of the populated areas of Canada? To be honest, the blue jay has always been my favourite bird. We just recently moved from a suburban city in the province of Quebec to a rural, secluded town in northern Alberta. I still get to see blue jays from my window facing the yard. To see its colours has always been a light in my day. It's a beautiful, majestic bird. Lots of these guys around! Upon moving to Alberta, I was apprehensive. Making new friends was daunting. I moved here in June. With the sun's warming rays, I spent much time on my patio. I began every day with the sunrise, and a screeching bird, which I could not see. Then one morning, with a flutter of feathers, right beside me she landed. Neither of us moved, but shared wide-eyed looks. She stayed there for two minutes. Then, she was gone. The next morning, I took out peanuts with me, and placed them on the table. I even shelled them for her! She ate, and I watched her. This came to happen each day! I could not think of a proper name for her, so my greeting each morning would be "Good morning, My Girl!" As time passed, she ended up bringing friends with her. The others were more timid than her. She would be the only one that actually stood on the table right with me. I would place peanuts around my yard and on the fence for our mutual friends. My yard was filled with their screeching, and the stunning colour of their plume. It was simply magic. Winter came. I filled all my feeders with food for my gentle friends. Throughout the winter, I have heard just one voice. The one from My Girl. I have not seen her, as my days now begin much earlier than the sun. I await the warmer temperatures, where I can meet up, and spend mornings with my special friend again. The blue jays in my neighbourhood are friendly and you know immediately when they are around. They are a graceful bird in flight, and make me happy when I see them anywhere I go in Canada. Not only does the blue jay represent Canada in professional baseball, but it also STAYS in Canada all year round. Nothing is more Canadian than suffering through several feet of snow for several months of the year.